This entry was posted in November, This Week in History, _This Day in History, _This Month in History, _This Week in History on November 25, 2018 by CZ. The following comes from our text, Lands of Hope and Promise: A History of North America. For more information on Lands of Hope and Promise, go here. To see sample chapters of this book and our other books, go here. For ordering information on this and our other texts, please go here. Washington had wanted to retire at the end of his first term, but at the entreaties of Jefferson and Hamilton, he agreed to stand for a second term. No one opposed Washington in the election of 1792 and, once again, he was elected with a unanimous electoral vote. In his second administration, Washington faced difficult problems. For one, Great Britain still refused to abandon the forts it held in American territory. More serious, British ships were seizing neutral American ships bound for France and the French West Indies and impressing American sailors. Too, the refusal of Spain to allow American farmers passage down the Mississippi jeopardized the union of the western territories with the United States. Then there were the Barbary pirates of the northern coast of Africa who seized unprotected American ships and imprisoned American sailors. 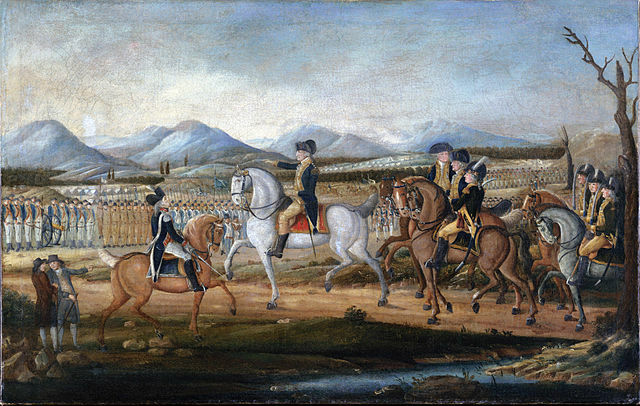 George Washington reviews troops in Cumberland, Maryland, before marching against Pennsylvania farmers. More serious were developments farther west. The British lieutenant governor of Upper Canada (later named Ontario), John Graves Simcoe, built a fort on the Maumee River, 100 miles southwest of Detroit — well within United States territory. Worse, Simcoe was mobilizing and arming the Indians in the Northwest Territory. Fortunately for the United States, the western army of 2,000 men was under the command of Maj. General Anthony Wayne. Called “Mad Anthony” by his men for his reckless courage, Wayne was a consummate strat­egist and expert in the art of forest warfare, in which he relentlessly drilled his men. Reinforced by several hundred Kentucky riflemen, Mad Anthony moved north towards the Maumee, fighting Indians in the dense forest lands of Ohio and Indiana. Reaching the Erie Plain, where lay the log cabins and cultivated fields of the Indians, Wayne built Fort Defiance and offered the Indians peace. They refused his offer and retreated to the vicinity of the British fort. There, behind a natural stockade of fallen trees, members of the Miami, Shawnee, Ojibwe, Potawotomi, Sauk and Fox, and Iroquois peoples, along with a contingent of Canadians led by an old loyalist commander, awaited Wayne’s advance. On August 20, 1794, Wayne attacked the Indians and Canadians in what became known as the Battle of Fallen Timbers, a short fight that in 40 minutes completely routed the Indian force. Wayne followed up the victory by burning Indian homes and laying waste their fields. At the forks of the Maumee in Indiana he raised Fort Wayne. A year later, tribes from the region between the Mississippi, the Great Lakes, and the Ohio met with Wayne and signed the Treaty of Greenville. In this treaty, the Indians ceded to the United States the entire southeastern section of the Northwest Territory, as well as the sites of Vincennes, Detroit, and Chicago. In return, they received $20,000 and the promise of a yearly payment of $9,500 in goods. But the Treaty of Greenville did not end the disputes between the U.S. and Great Britain. To resolve the disputes, President Washington had sent Chief Justice John Jay to negotiate a new treaty with Great Britain; but when Washington saw the treaty, he feared to publish it. This entry was posted in This Week in History on November 18, 2018 by CZ. This entry was posted in This Week in History on November 11, 2018 by CZ. This entry was posted in Blog on November 5, 2018 by CTP Editor. A comet scored the heavens at the moment of his birth, an event that presaged his future greatness. His father, a Shawnee chieftain, named him Tecumseh (“Panther Crossing the Sky”), in token of the omen. From his earliest days, Tecumseh watched as white settlers crossed through the Cumberland Gap, over the mountains, to take his people’s country, west­ern Virginia and the rich lands of Kentucky beyond. He saw his people fight these settlers, only to be defeated in battle after battle; his father, Puckeshinwa, fallen in battle; his mentor, the chieftain Cornplanter, shot and killed; his elder brother, Chiksika, slain at his side — all these deaths, and many more, weighed on Tecumseh’s spirit. He waxed more bitter and angry against the people that flowed in, in ever increasing numbers, over the mountains. The 26 year-old Tecumseh was among the defeated at Fallen Timbers in 1794; but unlike his fellow chiefs, he had refused to sign the Treaty of Greenville, which handed millions of acres of land over to the United States government for yearly payments of $10,000. This entry was posted in This Week in History on November 4, 2018 by CZ.